I think it is the third most popular 8 bit machine after the C64 and Zx Spectrum! Enterprise launch in Hungary at 1987 May 19. It is very interesting you not heard about the Enterprise Computers Gmbh! It is started at 1985 August 13. the news is in the Private Enterprise magazine Issue 2 at page 5. The German company never call the original developers for continuing the work? If the German keyboard is new for you, what do you think about these? Do you looking for own one? I can send one if you want! Wow! Love that cake! Looks like that joystick might be more robust than the original! It is possible I did a version of IS-BASIC with German error messages but I can't remember doing it. I didn't know Enterprise Gmbh continued after Enterprise UK collapsed, that is a surprise! That new Enterprise model would have been awesome! It just goes to show how insulated we were in IS from what Enterprise Computers were doing. I'm sure we had nothing more to do with the Enterprise after the collapse of IS and Enterprise UK...we were very busy with our next venture! I have often thought how few software iterations there were - normally there is a continual cycle of bug fixes and releases with software. In my memory it just didn't happen much, I always assumed because it just ended at the collapse. There is a huge amount of hand-written assembly in IS-BASIC, EXOS and EXDOS - there must be loads of bugs! And I definitely have never seen that Arabic keyboard! Does it print from right to left on the screen? That is very kind of you to offer to send me an Enterprise - thank you very much - I will get back to you about that. I have just bid on one on Ebay that also has a FORTH cartridge which is the first I have seen since I have been looking, so I will wait to see what happens. I am more proud of the FORTH than the BASIC - it was way faster than the other FORTHs around at the time, even the FORTH-only Jupiter ACE. IS-BASIC has a lot of good features, but speed is not one of them! It is possible I did a version of IS-BASIC with German error messages but I can't remember doing it. Your memory is good! The German messages are in the language expansion ROM, this also contains a new KEYBOARD device and character set, and EXOS command and variables for switching the language. Later Hungarian, Spanish and Danish versions were made. But what your team did: built in the capabilities into the EXOS and BASIC for the extension programs can handle the messages. This is the miracle of the Enterprise: everything can be expanded! There is a huge amount of hand-written assembly in IS-BASIC, EXOS and EXDOS - there must be loads of bugs! Yes we know some bugs but there are surprisingly few! I fixed some of them. In the EXOS 2.0 there is a very spectacular bug at the startup: at the power on the Nick registers filled with random values, and the EXOS 2.0 not set the border to black before the RAM test. This means most of the screen is filled with random border color. This bug is fixed in the EXOS 2.1 but I don't understand why it had not been noticed previously by the developers. But now when you talked about the wired prototypes I got a idea: it is possible the wired prototype started with zero filled registers and the problem became visible only after the real Nick chips had arrived? Unfortunately we only know: 4000 EP64 went to Egypt. Lately one English man worked in Egypt and bought old computers in flea market and sold in Ebay. These arabic EP-s are from him. The machine works as a normal English machine. I asked him if he had ever seen Arabic sw for these but he said he had never found any EP sw.
We also know 3000 Enterprises went to Sovietunion, but don't know if these are cyrillic? also has a FORTH cartridge which is the first I have seen since I have been looking, so I will wait to see what happens. IS-BASIC has a lot of good features, but speed is not one of them! But why was the Enterprise not released originaly with 6Mhz CPU? This design is originally ready for this! Only the oscillator needed replacing, Z80B instead the Z80A, and modify only one bit in the EXOS (for Dave initialized with 6Mhz frequency). After the long delays this 50% extra speed was some compensation and some advantages over competitors. After the long delays this 50% extra speed was some compensation and some advantages over competitors. but at the same time! You may well be right about the border colour. Another possibility is either a different batch of Nick chips with the first batch happening to power up with the register at zero by accident, but not the later batch. Another possibility is just slightly different conditions as the Enterprise comes out of reset eg. different capacitor values on the reset line or different properties of the power supply. I have seen problems with this sort of thing since - it's easy to write a program that forgets to initialise a variable because it always powers up as zero, only for a production change to change that and break the sw. I can't answer your question about the Z80B. I can only imagine that it was either a cost or availability issue. As you say it might have partially compensated for all the delays. I am continually amazed and flattered by what you have done with the Enterprise and in how much depth you have researched it! ...in general the TVC had to be cheaper than the Enterprise, which meant smaller ROMs so "cut down" versions of the software. I have just remembered another reason (possibly the main reason) why the TVC had to be "cut down" - there were UK government restrictions on exports of high technology to Hungary at the time we were developing it. Low-tech was ok, so a 6845 video display chip would have been ok as they could tell it couldn't be used in a nuclear weapon, but a high-tech Nick chip would have been a no-no. Presumably things had changed by the time 20,000 Enterprises were shipped there! A sign of the times. Another possibility is just slightly different conditions as the Enterprise comes out of reset eg. different capacitor values on the reset line or different properties of the power supply. At the final Enterprises the reset not reset the Nick only the Dave and Z80. I would probably need a manual for my own FORTH because I cannot remember enough about it from all those years ago! I got the original English user manul few months ago (previously we never have it ), I will scan it shortly! Today I leafed through the book, it is look a very interesting programing language! First question: it is talking separately about the IS-FORTH and then the Enterprise specific FORTH things. The IS-FORTH is released for other systems? Or it is planned for later but not happened because the collapse? I can't answer your question about the Z80B. I can only imagine that it was either a cost or availability issue. I hope one day somebody from the Enterprise Computers will find us and can answer for this and many other questions! Good evening, Bruce! It's really cool to have someone onboard who contributed as much to the Enterprise computer as you have! Your posts are quite entertaining, and they bring back a lot of fond memories... for all of us, as it seems. The Enterprise was so much better than any of the toys of that era... I mean... it really was intelligent. I'm still laughing at console windows these days that don't wrap around words so nicely at the end of a line as the Enterprise editor did... sure, CP/M and MS-DOS have existed quite a few years before _our_ computer, but come on, this is the 2010s now, and they still don't do it - or am I missing something? Could you share some information about EXOS versions prior to 2.x? Or was 1.x simply what we would call an 0.x alpha/beta build today? It is not only the UK, generally the West countries made a technology embargo against the Eastern block. Up to now we know the story: The Videoton bought the early version of the Enterprise. You say this is false story (probably at that time the Hungarian management told this), it is not an early version, it is a cut version which meet the technical embargo? How did the TVC developement happen at the IS? Is it another wired prototype? Or you got a real machine? For help refreshing Bruce memory I will write summary what we know about the early versions, and I hope Bruce can add more information pieces for the history. Thank you; now you mention it I do remember having long discussions about word wrapping and what a "word" is, and yes I agree with you there are many editors and word processors that still do not get it right, it drives me mad too! It's not difficult, it just needs thought and attention to detail. Unfortunately my memory is rather hazy on how EXOS went from 1.x to 2.x but I will read zozo's documents and see if it jogs any memories. You say, this is false story (probably at that time the Hungarian management told this), it is not a early version, it is a cutted version which is meet with the technical embargo? The TVC developement how happened at the IS? It is a another wired prototype? Or you got a real machine? Ah COCOM...that rings a bell! I'm pretty sure the TVC was a new hw design put together by Videoton, not IS. I do remember having to wait for the hw to be shipped to us from Hungary. But they may have bought the Enterprise design and used some ideas (like the built-in joystick). There's certainly no Nick or Dave chip on the circuit board! It is possible IS's hw engineers were involved with the design but I don't recall seeing or using a prototype in the UK. The video is completely different (no Nick), the sound is different (no Dave) and the memory paging is less flexible (again, no Dave). As far as I know there was never an early Enterprise without Nick and Dave - I certainly never saw one and we didn't use one for sw development. And the TVC software was definitely written after the Enterprise software. The BASIC was written from scratch but I can't remember what happened about the OS - it might have had the EXOS calls etc or it might have been completely different - you probably know more than me! In Hungary all sold machine is Enterprise 128 with EXOS 2.1 and IS-BASIC 2.1. We were thinking about for a long time why 2.1? 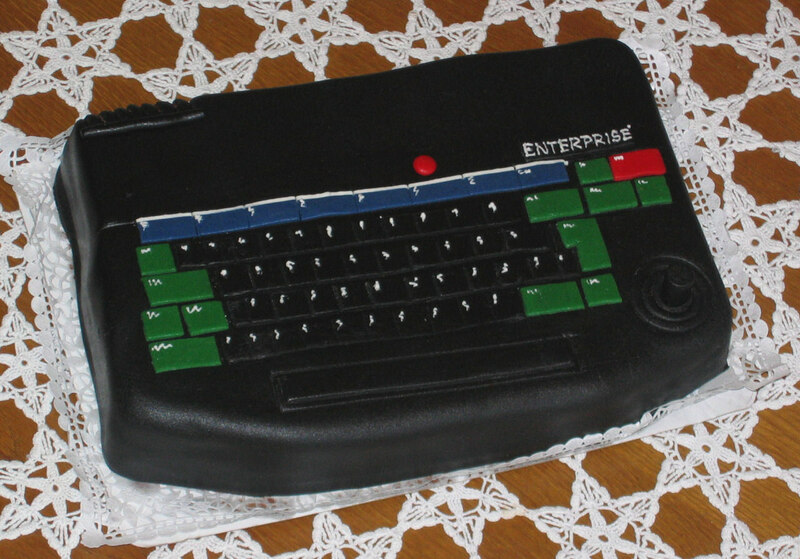 Later at the internet time when firstly contacted with English users get the surprise: the Enterprise 64 have a EXOS 2.0 and IS-BASIC 2.0. Ok, it is a earlier version... but why 2.0? ?, where is the 1.x? In the last few years I got some documents which are from the pre 2.0 times! 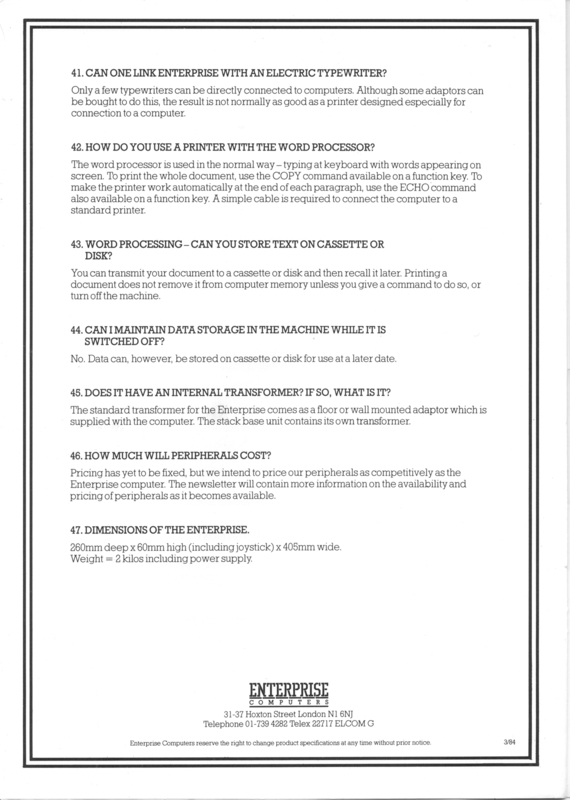 - 1984 Sept EXOS 1 Technical Manual (subversion unknow ) originaly come with the 000043. machine to a sw developer. But the machine have a 2.0 ROMs (but in EPROM not a ROM). Early Function key labels, this is shown on many books on the cover Enteprise 64 photo. No cartridge at the accessories! Later it is talking about the cartridge as expansion capatibilities. Startup screen is very different than the well known! 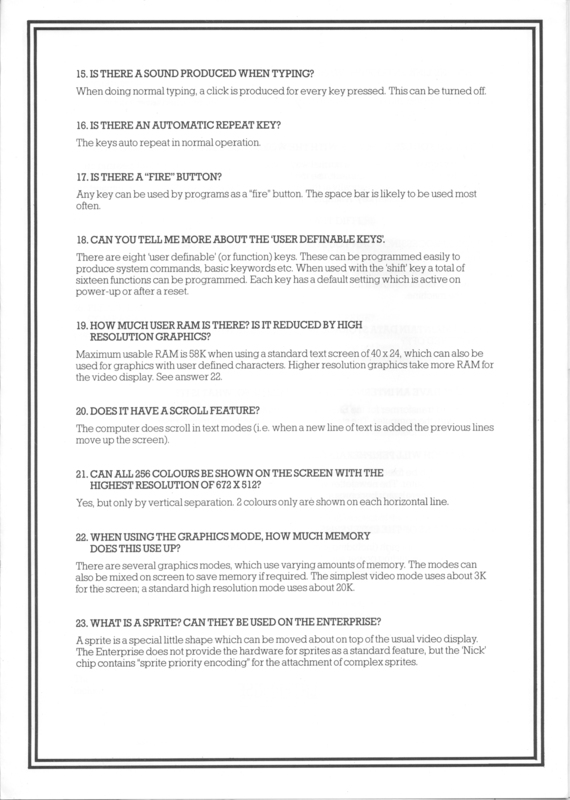 The Technical Answers 19. also say 58K free memory what we see at the ELAN startup screen. The answer 42. talking about these: this is a word processing function. - no EXOS file format. This means machine code program can't loaded directly. Some very early machine code games (for example Beatcha) using BASIC loaders for loading the code. I think this is the reason. The loadable EXOS extensions are also missing. - video device using 256 characters set, the 128 characters are doubled as default. Later 128 characters set used, this is reduced the memory usage with 1152 bytes. Originaly the EXOS and the BASIC still in one ROM chip on the motherboard, no cartridge needed! The machine is directly started with the BASIC, no ENTERPRISE copyright display. Programs can be LOAD-ed by the BASIC such as other machines. No WP, but the BASIC have some primitive word processing (type and print) capatibilities. When run out the ROM space, then the decision: BASIC will going to the cartridge! Then the EXOS got a lot of free space, added the EXOS module format, loadable system extensions, etc. Plus added the normal Word Processor program, and in the remaining space the blinking ENTERPRISE startup screen. Some parts of the BASIC still remain in the onboard ROM, if I know right then the mathematical routines. Other languages (LISP, FORTH) use these routines? And it is very interesting: the EXOS 1 manual from 1984 September. The EXOS 2.0 from 1984 November. All of these enhacements writed in these few months? I certainly never saw one and we didn't use one for sw development. It is very interesting! The sw how tested? You send to Hungary, and go back a bug list, fixing, send a new version...? what happened about the OS - it might have had the EXOS calls etc or it might have been completely different - you probably know more than me! It is different but the principles are very similar! I think it is reduced version of the EXOS for the simplier hw. Once again zozo I think you have worked out the situation perfectly. So am I right in thinking 1.x is Elan, 2.x is Enterprise? I think we just carried on developing until the hw was nearly ready to ship! And you are quite right the original intention was for everything to fit in the internal ROM with no BASIC cartridge, but we ended up having to split BASIC between a cartridge and the internal ROM. There was no plan to allow other cartridges to access the BASIC floating point in the internal ROM - I don't know if it would work or not and I wouldn't be surprised if it didn't! I'm not even sure what would happen if you used the "wrong" version of the BASIC cartridge for the internal ROM. I'm not sure about those manual dates - possibly we just edited the EXOS 1 manual a bit to make it suitable for external publication, and changed the date at the same time! No, I think they sent us a machine from Hungary. I remember waiting for it to clear customs. I may have done one or two revisions but they had everything they needed to fix bugs themselves, and I remember them pinpointing a particularly difficult bug at one point. They were pretty smart and lived up to the reputation Hungarians have here in that respect!